Limited desk copies available for educators in paper format. Please email cct@criticalthinking to inquire. Critical Thinking Reading & Writing Test assesses the ability of students to use reading and writing as tools for acquiring knowledge. To appreciate the significance of this test, it is important to understand the integral relationship between reading, writing, and learning. 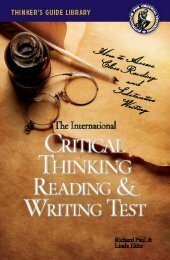 The International Critical Thinking Reading & Writing Test assesses the ability of students to use reading and writing as tools for acquiring knowledge. To appreciate the significance of this test, it is important to understand the integral relationship between one’s ability to read and write and one’s ability to learn how to learn. Students who think critically routinely read texts that are significant and thus expand their worldview. Recognizing that every text has a purpose, they clarify the purpose of texts as they read them. Recognizing that close reading requires active engagement in reading, they create an inner dialog with the text as they read—questioning, summarizing and connect­ing important ideas with other important ideas. Students who think critically use writing as an important tool both for communicat­ing important ideas and for learning. They use writing to deepen their understanding of important concepts and to clarify interrelationships between concepts. They consistently write in such a way as to become more clear, precise, accurate, relevant, deep, broad, logical and significant as thinkers. In writing, they are able to clearly and accurately analyze and evaluate ideas in texts and in their own thinking. They consistently learn to write as they write to learn. In other words, they use writing as an important tool for learning ideas deeply and permanently. The purpose of the test is to assess students’ abilities to think in particular “disciplined” and skilled ways. If successful, the results make it possible for those who interpret them to determine the extent to which students have and have not learned foundational critical thinking reading and writing skills essential to intellectual analysis and evaluation, skills essential to the educated mind.